For stateside subscribers to GSM carriers who are eagerly anticipating Sony’s flagship smartphone, the Xperia Z3, the wait has finally ended. The electronics giant has begun selling unlocked, off-contract variants directly to customers in the U.S. through its online store. 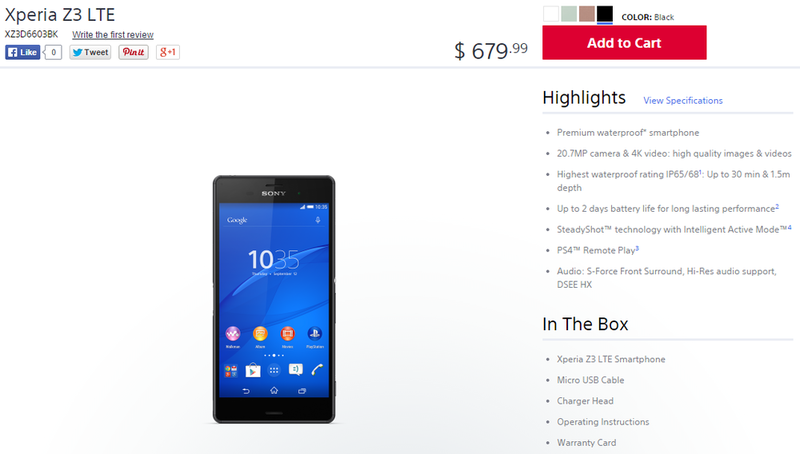 $679.99 will yield you an Xperia Z3 in White, Silver Green, Copper, or Black. It may be one of the few ways to procure the GSM model in a timely manner; Verizon is selling a customized CDMA model, T-Mobile continues to offer no more than a vague “fall” release window, and the possibility of AT&T offerings seems increasingly remote. In terms of included hardware, the Xperia Z3 may not be on the bleeding edge, but it has plenty going for it. It features a 5.2″ Full HD TRILUMINOS display, 20.7MP rear-facing camera, Snapdragon 801 processor, 3GB of RAM, microSD, 16GB or 32GB of storage, Bluetooth 4.0, IP 65/68 rating (water and dust resistant), 3,100mAh battery, and runs Android 4.4+.